Norman Williams recently enquired if anyone could help him to locate Eurog House, New York Terrace, Abergele. 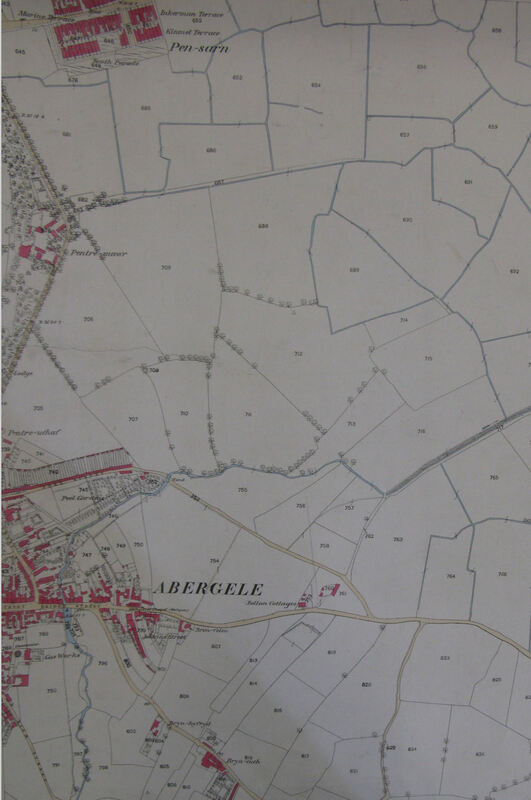 Two of his late relatives, Mary Roberts (nee Williams) and her husband, Owen Roberts, had lived there prior to their both dying in early 1901 (see The Old Pubs, Inns & Taverns of Abergele in the 1800’s). Unfortunately I wasn’t able to find anything marked on any of the surviving terrace buildings to indicate which it might have been. There again, it’s not unknown for house names to change down the years either. 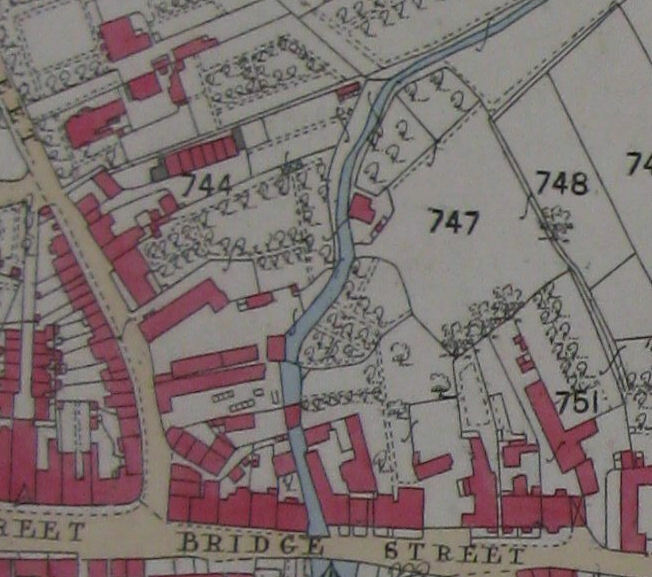 There was, however, another adjacent terrace which no longer exists (see the 1872 map section above). That was called New York Street and comprised 10 properties, whereas New York Terrace had only 7 properties originally. The Terrace and Street, like Roche House which faced them, were all built by John Jones prior to 1861. 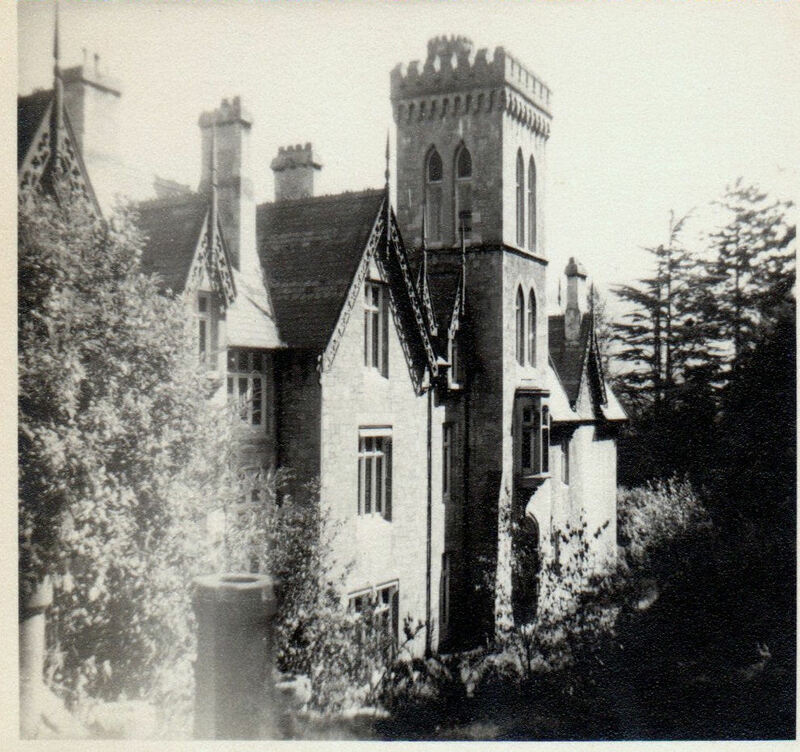 The above postcard shows Roche House on the extreme left. The right side of the same image shows the gable end of the first/last of the terraced houses in New York Street with the access just visible beyond. Can any of our readers, perhaps with a more intimate knowledge of the area, shed any light on Norman’s query? My only other thought would be for him to contact the Local Archives in Lloyd Street, Llandudno to see if the 1900 Rates Books might clarify matters. I’ve put their contact details on the Pubs, Inns & Taverns page which has Norman’s original enquiry. 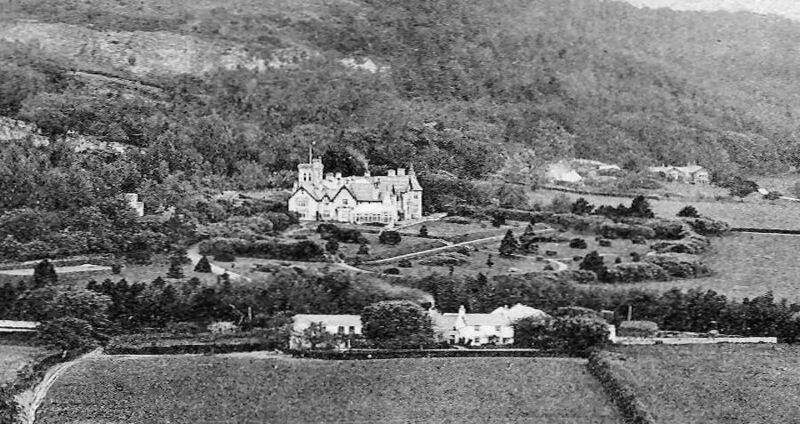 Further to Gareth’s 1925 postcard of Bryngwenallt, I came across one which appears to be slightly earlier, probably pre WW1 showing Bryngwenallt Hall, with Siamber Wen farm in the foreground. I would imagine the photo was taken from above the the Red Rocks area, possibly a place we local children called ‘The Glass House’. That was the site of one of (Abergele Sanitorium’s) Plas Uchaf’s old chalets forming part of the outlying TB wards’ buildings. Bryngwenallt’s gardens appear truly beautiful, as befitting such a splendid property. It was very sad to see how the Hall lost so much of its former glory, to my mind, from the 1960’s onwards, to become a mere shadow of its former self. 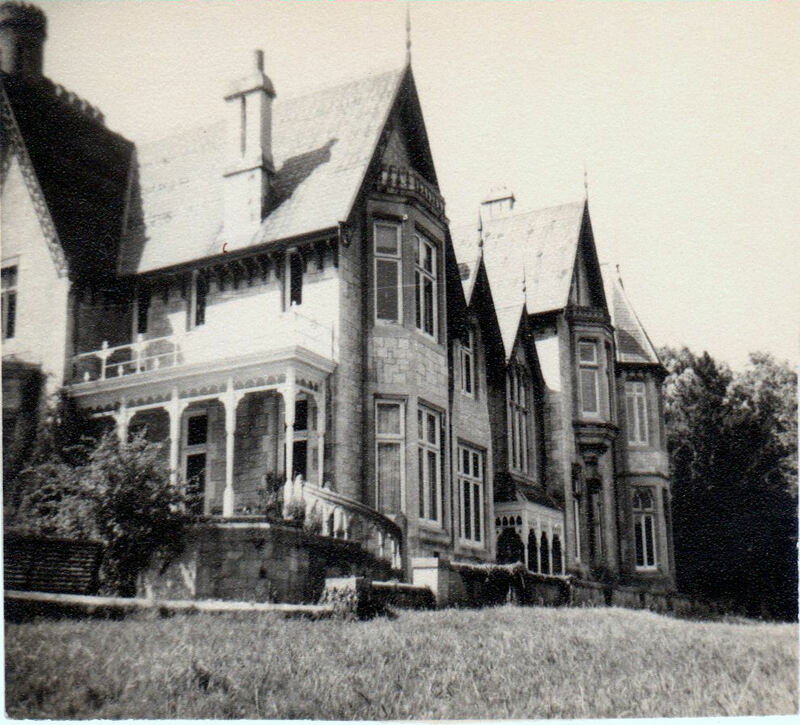 Bryngwenallt Hall – date unknown. I’m afraid I don’t know when they date to but, in the same way that they resurrected long-forgotten happy memories for me, I’m sure they will do the same for other of our readers. Many thanks for your input Garry & for sending them for inclusion on the site. Does anyone have any group photographs, or know the whereabouts of any, taken during the period 1963-1969 of staff and pupils of the Old Abergele Grammar School please? My recollections of my school years are fast fading and I’m hoping that access to such photos might just jog my memory. Many thanks. In replying to a query posed by Gareth regarding the Sun Inn (see Market Street topic), he suggested that I start a new post on the subject of the old pubs in the town, so here goes. 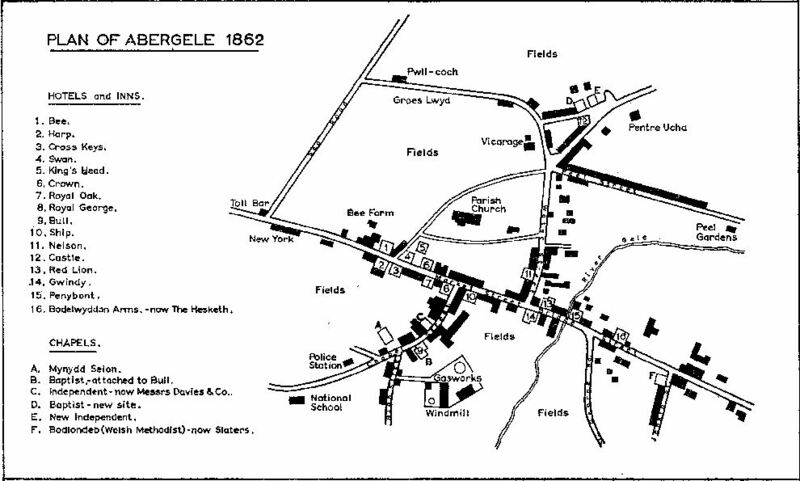 EWW makes reference to the Rate Book of 1859 which lists 14 taverns etc., whilst an 1862 Plan of Abergele (see below) shows 16 Hotels & Inns. Those in the Rate Book (annual rental shown in brackets) were The Gwindy (£15), Ship (£16), Mona Vaults (£12), Bull (£20), George & Dragon (£7), Royal Oak (£16), Cross Keys (£16), Harp (£18), Swan (£14), Kings Head (£10), Crown (£18), Nelson (£34), Castle (£18) and lastly, The Bee (£184). The last two are the Penybont and the Bodelwyddan Arms (Hesketh) which I will deal with first. The Penybont was originally the name of the house which adjoined a low, narrow tavern which ran alongside the river Gele and to which it was later joined to form the present-day building. Similarly, the Bodelwyddan Arms, as it was known in 1861, was also joined to the next-door house, forming the Hesketh of later years. The Castle was the last of only three pubs in the town to be joined to the house next door in the 1860-1900 period. The Castle, then as now, is situated at the northern end of the junction between Pleasant Place and Dundonald Avenue. Around that time there was a clamour to close or pull down the small taverns. The Compensation Act, which had recently been passed at that time, might have been all the incentive required in some cases. But I digress. 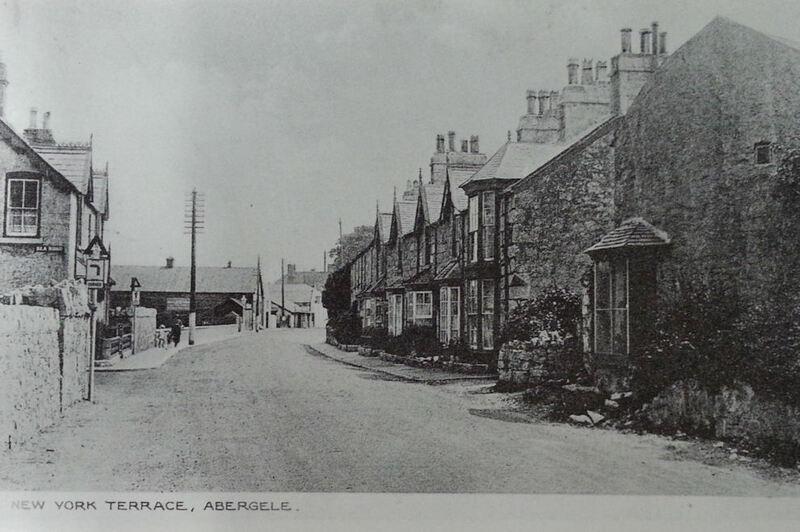 From the 1860’s onwards Abergele saw much change, which included the disappearance of many of its taverns. Of the few left from the 1859/1862 period, only the Gwindy, the Bull (Hotel), a larger and much improved George & Dragon, the Harp (whose frontage didn’t alter at all between 1861 & 1911), Castle, Bee and Penybont survived. The Hesketh is still there on Bridge Street, almost opposite St. George Road, but under a new guise. Although the name ‘the Ship’ survives to modern days, it is not the same Ship Inn as mentioned in the listings however (see below). The Bee Hotel, two doors up from Church Street’s junction with Market Street, still occupies its original site. But what of the others? That part of the modern day Peter Large’s property closest to the Harp is where the Cross Keys once stood. Described as ‘quite a good house with its two front rooms, one a shop, the other a tavern’ it was run by one Huw Jones in 1861, a joiner and zealous Baptist according to the diaries. Directly across the road, where Reeds Rains is nowadays, was The Swan. The original building was demolished to be replaced by a chemist’s shop in later years. The Crown is where Gwalia House, a modern day butcher’s shop, now stands. It was a butcher’s shop even in the late 1800’s, as well as a tavern, kept by a prominent Wesleyan, Edward Roberts. Behind the Swan and the Crown stood the Kings Head. The Royal Oak occupied one of the five small ‘two-up, two-down’ houses between Liverpool House (the bridal shop) and the Harp, probably where the barber’s shop is today. Interestingly, in 1891, the Post Office (formerly at Bowden House in Chapel Street) moved to one of those houses where it remained until moving to the present location in 1909. The George & Dragon was known as the Royal George in the early 1860’s. Originally described as ‘a low, old thatched house with no loft to it’ one can perhaps understand why the annual rent only increased from £7 in 1859 to £18 by 1890. For comparison The Harp, Crown & Castle were all rented at £18 p.a. in 1859, others somewhat more. Charles Jones’ diaries take us on a clockwise tour of the town so we will pick up his descriptions in Water Street. Where the present day Tannery Court now is a cluster of half a dozen properties once stood, one of which was the White Horse tavern. For some reason, Ellis Wynne Williams’ book doesn’t show this on the 1862 Plan, nor does he mention it being in the 1859 Rate Book. He does, however, mention Nelson Vaults, part of Nelson House where Prys Jones & Booth carry on their business today. Jones’ diaries describes it as ‘quite a large property where much business was transacted’. Across the road from Nelson House were three shops and the ruins (in 1861) of the old Lock Up. ‘In this block was the first North & South Wales Bank, the building next to it in the main street being for many years a tavern by the name of Bank Vaults’. This is another tavern which doesn’t make it into the lists in EWW’s book. ‘Next was the Red Lion, an important tavern which did much business’, sited where the current opticians is. The Penybont and Hesketh have already been discussed above so, bypassing them, our tour continues further along Bridge Street. Where Plas Newydd Buildings twin terraces now stand ‘there were many old thatched houses. Beyond them was an old long and low thatched house facing the road called New Inn. It had been a tavern long before 1861’ and is yet another not shown in the listings. It was situated roughly where Slaters have their Service building next to Ysgol Emrys ap Iwan these days. We now about-face and head back towards the bridge over the river Gele which, ‘in 1861 was a stone arch, considerably higher and narrower than it is now’ an improvement which occurred around 1906. 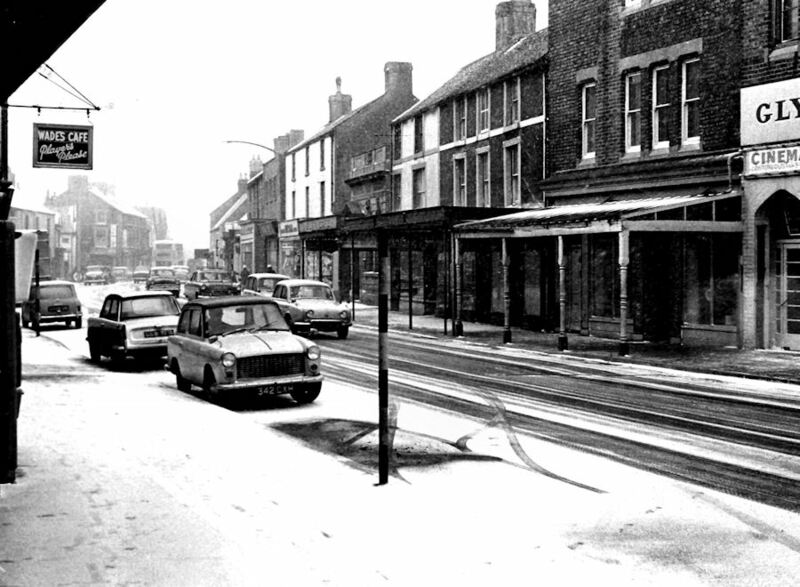 The first building on the corner of Glanrafon and Market Street (the Mobility shop) was a butchers for many years prior to becoming the Crown Bach (not to be confused with the Crown/Gwalia House at the other end of town). Proceeding onwards we arrive at ‘the Gwindy which remained unaltered between 1861 and 1911 and did a great trade’. Next came Cumberland house with a watchmaker’s shop, Glyn Luce, being built in the later part of the 1800’s on the site of the former tavern by the name of Mona Vaults. Though off topic, it is interesting to list the remaining properties from Glyn Luce/the Mona Vaults if only to show their diversity. ‘Then came Bryn House and then a private house with a milliner’s shop built about 1862 next to it. Also about 1861 a Watchmaker’s shop called Grenwich house was built next to the milliner’s. Then came a farm called Ty Newydd, … next was a shop in which Edwards y Caws sold cheese’. I have mentioned those because the next property was ‘the Ship Inn, a free house with two quite sizeable rooms at the front’. This should NOT be confused with the later Ship Temperance Cafe on the corner of Market Street/Chapel Street, which didn’t open until 1907. But, to continue our description – ‘between the Ship Inn and the corner of the Llanfair Road were two shops, a milliner’s and a grocer’s. Shortly before 1861, the grocer’s shop was a tavern called the Bull and when the present Bull Hotel was built, about 1860, it became known as the Bull Bach (Little Bull) because only one of its rooms was used as a tavern at the beginning, the other being used as a shop’. What later became the Ship Temperance Cafe, a Youth Club in my time and currently a Herbal Medicine Practice, was built partly on the site of the old Bull (Bach) Inn. The story behind the origins of the Ship Temperance Cafe is interesting in its own right but not for this page. Our perambulation of Abergele’s old taverns is almost complete with the exception of the northern side of Market Street. In 1861, the space where the Town Hall was later built in 1867 was just an open space. To the rear of this space the Market Vaults were built and served as a tavern between 1867 and 1910. 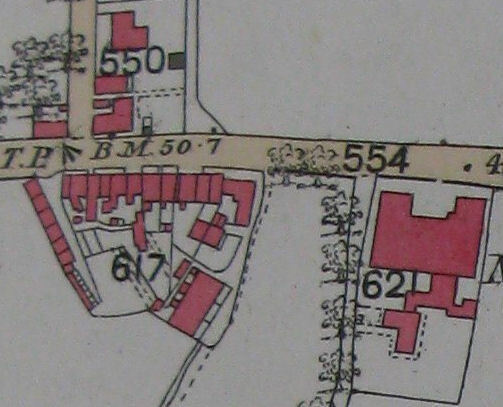 The houses (demolished in 1966) in Market Place were also built about 1867 and called Local Lane. By walking westwards along Market Street, we eventually arrive at the former sites of the Crown, King’s Head and Swan to complete our circuit. 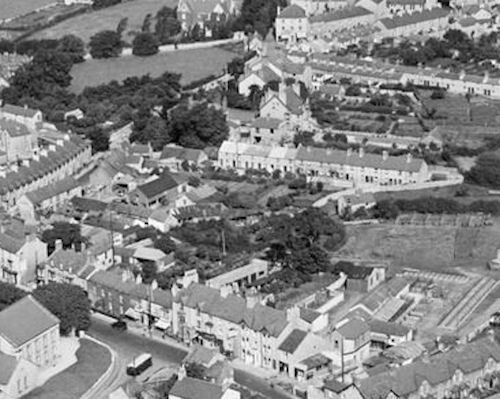 For the purists, Pensarn underwent much development in the 1850’s following the arrival of the railway in 1845, then remained largely unchanged from 1861-1911 apart from the disappearance of the White Horse Inn and the Glyn Vaults (their old locations unknown). This only left two remaining public houses to survive to the present day, The Railway (currently The Yacht) and the Cambrian (now The Park) both on the seaward side of the A548/Marine Road. The railway appears to have been the catalyst which brought about much of the change mentioned above. Gone were most of the old taverns, which had probably been little more than a couple of planks laid across trestles in someone’s front room and with a barrel or two of ale upon them anyway. A far cry from today’s public houses with their modern image, plying their trade in buildings which have survived for over a century and a half in some instances. Gareth, on 23 March last year you passed on an appeal for information from Juliet Roberts, regarding the location of Mount Cottages. Delyth MacRae & Brian Haynes were able to provide the answers. 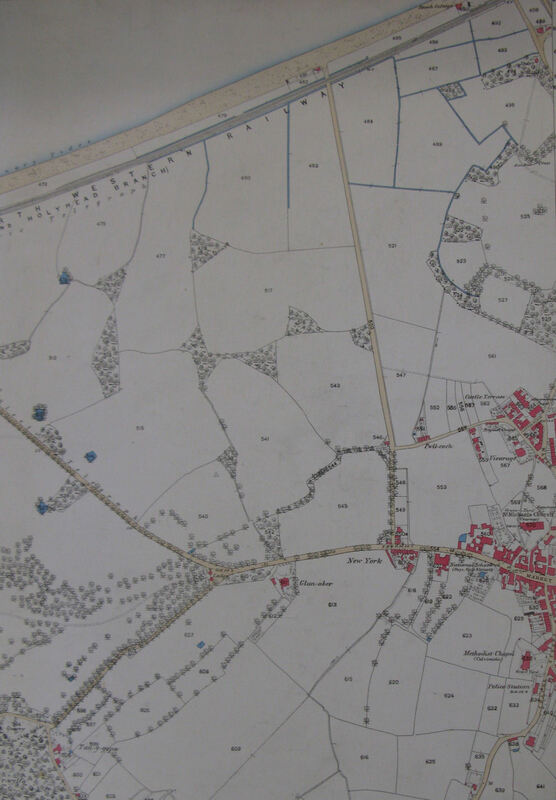 Subsequently I’ve found this copy of an 1872 map which may assist further. I’d always thought the cottages were those shown just above the No.744 in the image, immediately to the south of the Mount itself. Perhaps Delyth of Brian could clarify? 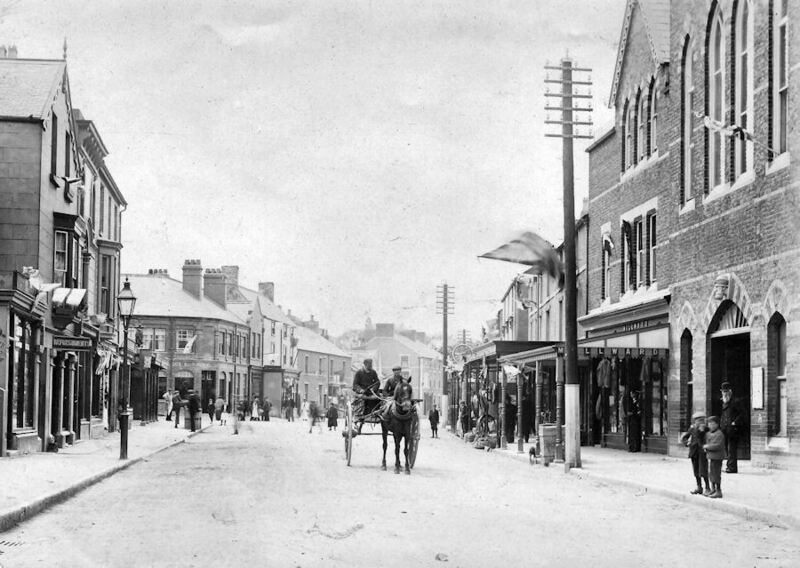 Above is an old photograph of Market Street of unknown date. It would appear that there is a flag flapping in the breeze, attached to the telegraph pole outside the Bank. Across the street, bunting adorns the front of several shops. Perhaps this dates to some time after the homecoming of Lord Dundonald, “The Hero of Ladysmith”, from the Boer War circa October, or slightly later, in 1900? The postcard above would appear to be of later date – perhaps someone has suggestions? The boys appear to be wearing knickerbocker or plus-four type trousers whilst the young girls have on pinnafore-type smocks. At the bottom right can be seen some of the goods on sale, displayed on the pavement, for the ironmongers (J. Pierce) next door to the bank. As a child, I seem to recall that there was a car showrooms together with a single, old-style petrol pump on the pavement where the ironmongers once traded. Does anyone else remember this or know further details? I made comment on Gareth’s ‘Abergele in Shorts’ story entitled ‘Hywel the Barber’ that my sister-in-law would sometimes buy me a Matchbox car as a gift. The small fire engine (middle bottom of the photo) is that first item, dating to the early 1950’s. The larger ones, to either side, were produced in later years. 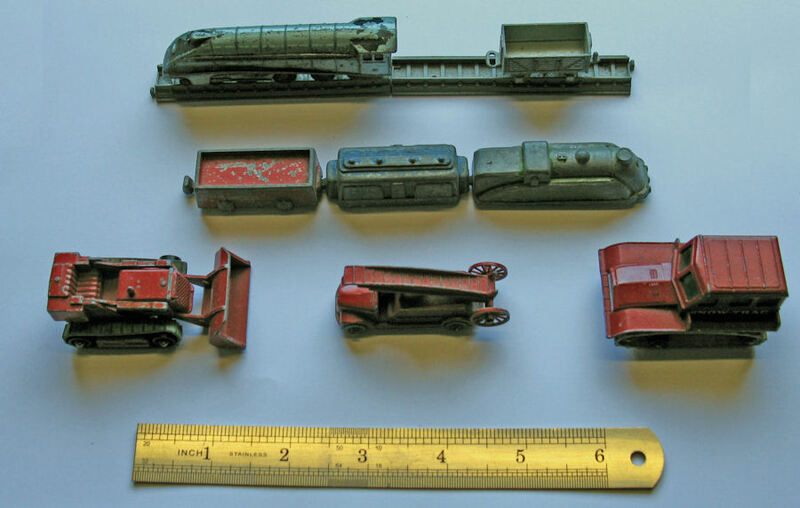 All were bought at Parr’s Toy Shop which used to be next door to the town’s Post Office. I also came across some other old toys which have somehow survived to the present day. The streamlined locomotive (Mallard perhaps), wagon and rail sections at the top of the photo were manufactured by Lone Star. The train in the middle has no manufacturers marks but was probably a hand-me-down from one of my older brothers and possibly dates to the late 1940’s or very early 1950’s. The 6 inch (15 Cms) ruler gives some indication of their small sizes. 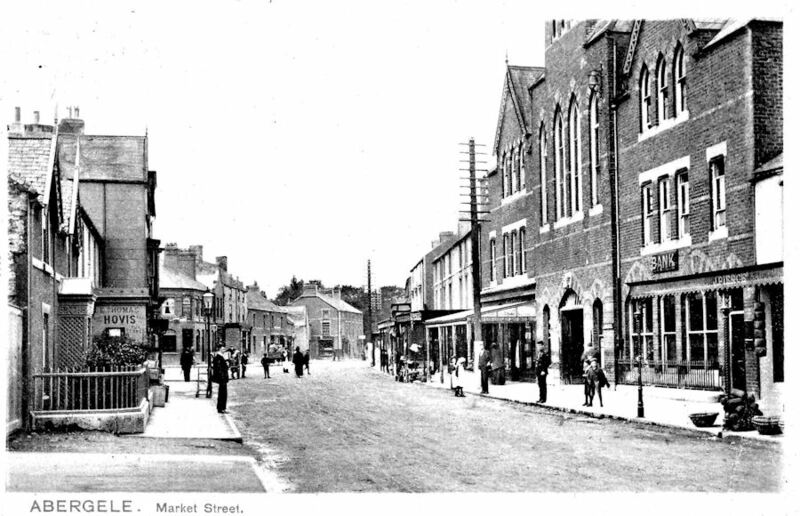 How many of you can still recall the old Market Hall in Abergele, a collection of shops etc., situated below the old Town Hall whilst providing a short-cut between Market Street and Water Street (opposite The Mount). It’s Gothic-arched entrance stood between the modern-day HSBC Bank on the right and Superdrugs to the left, where the Financial Consultant’s Office is now? Back in the 1950’s and early 60’s it all looked somewhat different. The Bank was called the Midland Bank and on the opposing, left-hand side was Millwards, a sizeable Milliners shop with its entrance doorway and main frontage on Market street itself, as had the Bank. As you entered the Market Hall, to your right, you would see a couple of frosted glass windows at shoulder-height, affording some extra light into the Bank’s customer space, which culminated with the Manager’s Office to the rear. A pair of us, more senior pupils from the National School, would sometimes take the dinner money down to the Bank, a welcome break from lessons. I seem to recall that the booking office and stairs up to the cinema situated over the Market Hall was also on the right-hand side, its main entrance being from Market Street – or was it to the left, next to Millwards? Perhaps someone could clarify that for me. To your left were large windows affording views into Millward’s whilst, immediately behind that property, within the Market Hall proper, was a butcher’s shop (Mr Roberts place ?). It had a large cold locker facing you as you entered, a display/serving counter to your right with the larger cuts of meat hanging from hooks on a rail behind. Smaller cuts of meat were displayed on white trays placed on a tiled shelf and visible through the main window, to tempt passing trade from the Market Hall. Sawdust was scattered over the floor. Next door to the butcher’s shop was an ironmongers store. It had an annex extending to almost the same length but about half the width out into Market Place. There, it joined onto a small terrace of properties on the left hand side of what was then called Market Place, but in the 1860’s had been known as Local Lane. On an historical note, by all accounts, Local Lane took its name from a Local Act which came into force in the town around that time (1867). As it was around that same time that the access road was opened through Market Place and the Market, a stone was placed at the Water Street end, engraved with the words “On sufferance”. The inference being that Kinmel Estates, as the landowners, were granting the town a privilege. Whilst those houses (built around the same time as the Town Hall) were demolished in 1966 the stone stands to the present day. Back inside the Market Hall and opposite the butcher’s, was a small, narrow sweets and tobacconists shop if memory serves me right, sandwiched between the rear of the Bank and the Cinema’s office. I have a mental image of the office having a single, large window where the glass was either painted dark green or had some sort of green covering to prevent prying eyes seeing inside. 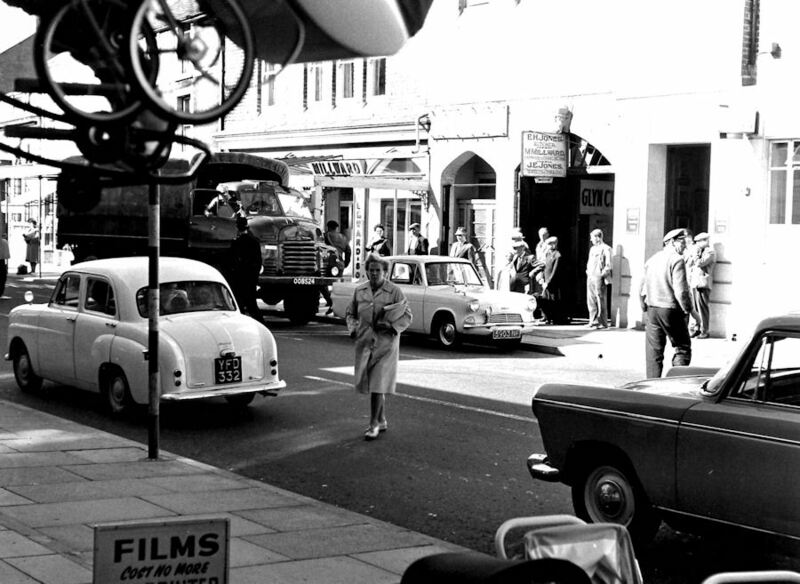 Can anyone recall the name of the cinema? I should know as one of my sisters-in-law worked there when I was young and, in my later, teen years, a girlfriend’s mother also worked there selling tickets. On leaving the local Grammar School in the 1960’s, I lost touch with the town and school-friends following the deaths of my parents in 1971/72. Consequently, when I returned to visit a number of years later, it was somewhat of a shock to see that the Market Hall was no more. Even the carved head of Robert Hughes (I believe it was) the builder of the Town Hall and which had sat above the Market Hall’s entrance arch since its construction in 1867 had gone, mislaid during works to the facade at some point they reckon. So, to the best of my recollections, that is a description of the old Market Hall and the shops it contained. If anyone can provide additional details it would be appreciated. 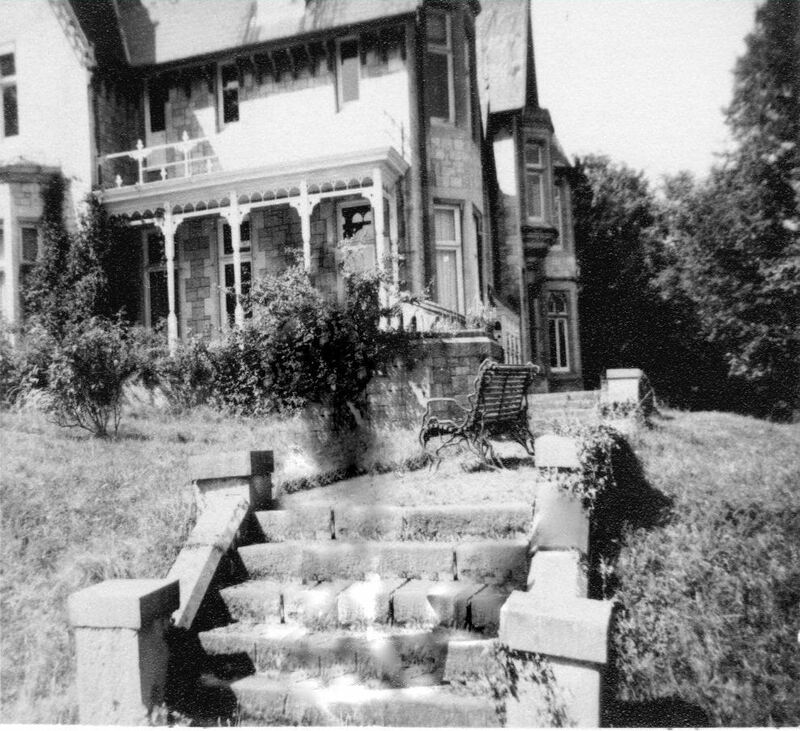 Since writing the above post, I’ve come across this old photo showing the entrance as it looked, probably around the late 1960’s or early 1970’s. This shows the cinema entrance on the left and not the right as I’d imagined. The butchers was called E.H. Jones and the sweet & tobacconists shop was run by J.E. Jones. The main entrance to Millwards shop is clearly visible next to the cinema entrance as is the carved head David and I mentioned, immediately above the sign detailing the shop proprietors. Above is a slightly earlier view from a different angle but clearly showing the name of the cinema as the Glyn. 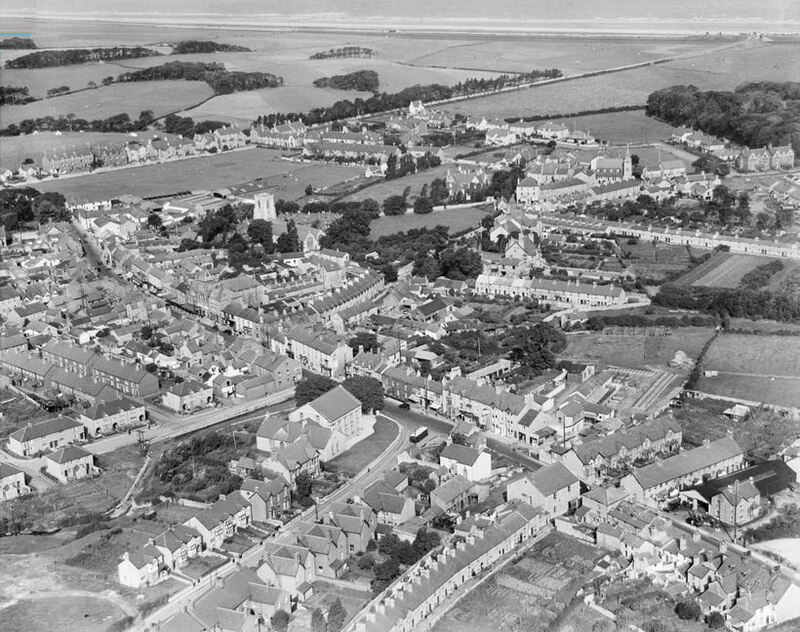 The aerial shot above was taken around 1923, looking over the town towards Sea Road in the top distance. It’s interesting to compare the view with the 1870’s map above, showing little expansion when compared to the modern day. The trees near the top right of the photo form part of Pentre Mawr. The small copses shown on the map image still appear in the photo, over 50 years later.